EVA Air is making flying fun for travelers from Chicago and throughout the Midwest with its Hello Kitty Shining Star Jet, starting today (May 31, 2017). EVA is using the cheerfully painted plane to add three weekly flights to the four it already operates with Boeing 777-300ERs in standard livery, increasing Chicago service to daily through the busy summer travel season. Travelers can learn more about the unique Hello Kitty and Sanrio Family Jets athttp://www.evakitty.com/en/index.html and book and buy tickets through travel agents, EVA ticket offices or www.evaair.com. EVA and Sanrio created the Hello Kitty Shining Star Jet with a cast of colorful characters painted the length of the plane, starting at the nose with Little Twin Stars Kiki and Lala flying through clouds with their teddy bear while, behind the wing, Hello Kitty and My Melody comfortably sail along on stars. EVA flight BR55 departs O’Hare International Airport at 12:30 am and arrives at Taoyuan International Airport near Taipei, Taiwan at 4:30 am the following day. Inbound from Asia, flight BR56 leaves Taipei at 7:50 pm and gets to Chicago at 9:10 pm the same evening. EVA flies its Hello Kitty Shining Star Jet from Chicago on this time schedule on Monday, Thursday and Saturday and to Chicago on Wednesday, Friday and Sunday. EVA gives travelers from Chicago and throughout the Midwest convenient travel choices to Northeast Asia, Southeast Asia and Mainland China. By the end of 2017, it will offer 88 flights from its eight North America gateways to Taipei with easy one-stop connections to every major city in Asia. Complementing the convenience of its frequent flights and one-stop connections, EVA has high standards for comfort and service. To and from Chicago, it offers three cabin choices, Royal Laurel Class business, Elite premium economy and Economy. Royal Laurel Class passengers get lie-flat seats and Rimowa amenity kits. Those in Elite Class have extra room, amenity kits, cozy blankets and pillows and the privacy of their own separate cabin. And in all three cabins, travelers enjoy EVA’s warm, friendly service, good Eastern and Western foods, in-seat entertainment systems Wi-Fi and Global Roaming. EVA currently flies six specially painted aircraft on routes within Asia and long-haul to Paris and, now, Chicago. 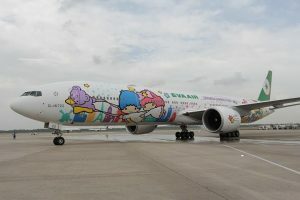 Each plane has its own theme and design that, in addition to the EVA Hello Kitty Shining Star, include the Hand-in-Hand, Joyful Dream and Celebration Flight Jets. Its Sanrio-family aircraft are the gudetama Comfort Flight and Bad Badtz-Maru Travel Fun planes. EVA is unveiling Friendship Bows in June, the last installation in its current series of new and refreshed specially painted liveries.